Already in Gallo-Roman period, our lands attracted the culture of the grapevine, and notably the poet consul Ausone. But it is only from the 8th century that the vineyard begins developing. An hermit come from Brittany gave his name to the actual village and his prestigious vineyard: Saint-Emilion. This man is the founder of the city. Several followers regrouped around him, of whom Valery, who was on the initiative of the re-development of the grapevine in this period. It is what explains that Valéry is our holy local boss of the winegrowers, while everywhere in France, it is Saint-Vincent. The appearance of a Commune to Saint-Emilion dates from the 12th century. It is in this time that the city sees endowing with a municipal institution : The Jurade. It is indeed in 1199 when Jean Sans Terre, brother of Richard Cœur de Lion and son of Alienor of Aquitaine, signs the charter of Falaise (in Normandy) on July 8th, so authorizing the creation of Jurade, real political organization which disappears in the Revolution and will become from 1948 our brotherhood and thus Ambassadress of wines of Saint-Emilion. Saint-Emilion is a medieval village having kept all his patrimony (in spite of the various disorders of the period of the French Revolution); it is also a 5400 hectares vineyard where it is happened that only red wines by some 950 wine growers, of whom the Bourrigaud family, which immortalizes its knowledge since the end of the 18th century. 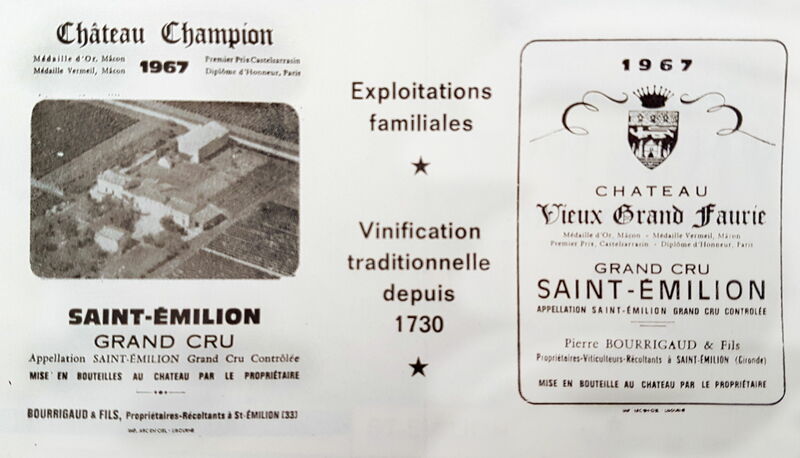 It is important to specify that the Jurisdiction of Saint-Emilion is classified in the World heritage of the Humanity by the UNESCO in conformance with cultural landscapes in 1999, and that it is the first time when a vineyard is recognized as such in 1999. 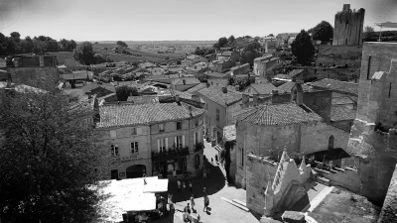 What a pride for the wine growers of Saint-Emilion! The BOURRIGAUD family is from the XVIIIth century. Pascal, who represents the 8th generation, resumed the succession of his father Jean in 1994. He runs the various properties among which Châteaux Champion and Vieux Grand Faurie who follows the ancestral traditions. These two properties have the name of their location. These last ones are on the map established by Pierre de Belleyme, engineer geographer, indicated by the Intendant Jean-Etienne de Clugny. His realization dates from 1785 and was resumed on the napoleonic land registry in 1831. In 1999, Pascal purchased a new property « Château Haute-Terrasse » situated in the Castillon-Côtes de Bordeaux Appellation, a neighbour of Saint-Emilion’s vineyard.